By undergoing high temperature temper treatment, Tempered-glass screen protector offers a good protection to the screen owing to its industry-high 9H hardness and the glass base, say goodbye to the possibility of scratches and enjoy a better touch experience. OMYFILM is engineered to allow your fingertips to glide effortlessly when using your phone or tablet. Our materials are designed to minimize friction and drag while remaining virtually invisible. Don't settle for less when it comes to keeping your mobile electronics secure! Since this glass screen protector is specifically designed to fully wrap the edges of Galaxy S8 Plus, it only has adhesive in the surrounding edges and is only friendly to slim cases. Wider cases will cause it to fall off easily or affect its using. Omyfilm is committed to making considerate and premium protection for your mobile devices. You will be entitled to have the products replaced if the products fail to be of acceptable quality and be supported with professional and efficient product & after-sales service guaranteed by Omyfilm. Our motivation comes from your satisfaction! If you need any more information about our products, please feel free to contact our team and we'll answer any questions you may have. If you're looking for the BEST protection for your mobile devices, search for our full collection today to find everything you need no matter which brand of smartphone you rely on. 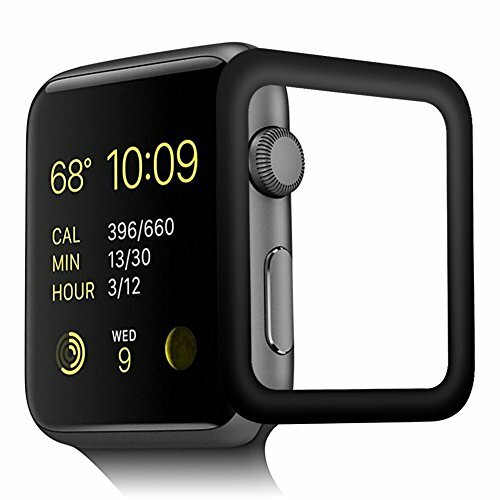 [Tempered Glass+Carbon Fiber] Made with the Highest Quality Tempered-Glass in the center and Carbon Fiber in the edges, which can completely pertain to the curvature of Apple Watch 3. Scratch Resistant- 9H Hardness provides protection against scratches, scrapes and cuts, puncture proof, resistant against UV light and will not yellowing. Ultra Thin- Crystal clear clarity with glass-like surface allows Real Touch functionality for a natural feel that provides flawless touch screen accuracy. Anti-smudge- Fingerprint repelling and easy to clean with microfiber cloth included in package. Significantly reduces dust, oil and fingerprint smudges. Easy Application- Error-proof, and bubble-free installation, simple for anyone to install. Any inquiries please feel free to contact us and we will offer our best suggestions. If you have any questions about this product by OMYFILM, contact us by completing and submitting the form below. If you are looking for a specif part number, please include it with your message.